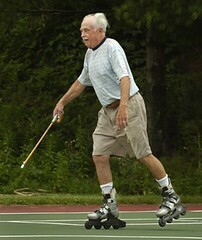 Take a guess as to when inline skates were first developed. Go ahead. 1950s? 1920s? 1900s? 1850s? Any takers on 1823? Because that is the correct answer. 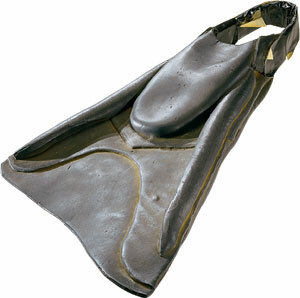 These skates were called the “Volito” and were used by ice skaters when there was no ice to be found. The unequal size of the wheels made this one of the more popular models because skaters could easily turn simply by shifting their weight from side to side. Abercrombie and Fitch may be known today for trendy clothes and semi-pornographic advertising, but back in the day that wasn’t the case. 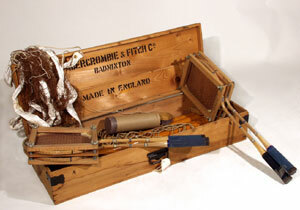 Check out this badminton set they produced around the turn of the century The wooden frames tightened around the rackets to keep them from warping brings back fond memories of the racket my father gave me when I was younger. Here’s the towel that was literally thrown in by Max Schmeling’s handlers in the first round of his bout against Joe Louis at Yankee Stadium in 1938. It was thrown back out by the referee because it was against the rules for handlers to stop a fight by throwing in the towel. 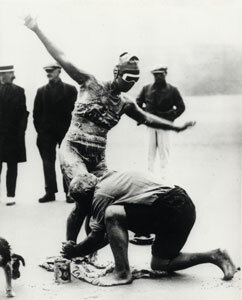 For her swim across the English Channel in 1926, Gertrude Ederle wore these watertight goggles she designed for the journey. 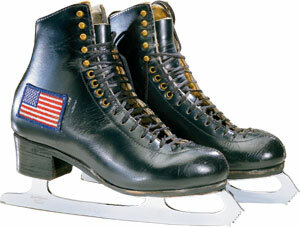 For the 1988 Olympics, Brian Boitano wore these skates. Harlick (the manufacturer) added the American flags for good luck. 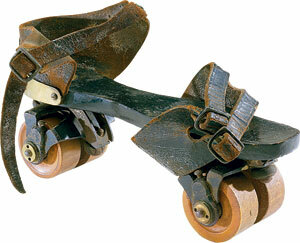 If prototypes of the in-line skate were available in 1823, surely the roller skate was already perfected, right? Not really. It wasn’t until 1863 that James Plimpton patented a model that most closely resembles what we have come to know. It wasn’t any sort of marine species that inspired Owen Churchill to create his rubber swim fins around 1940, it was Tahitian swimmers he saw attaching woven leaves to their feet. Bet you thought it was a dolphin or something. 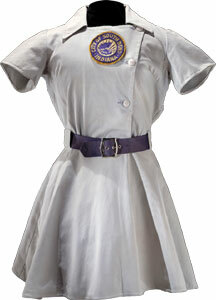 Billie Jean King wore this outfit, which at the time was considered flashy, in her match against Bobby Riggs. Oh, how times have changed. Loose Ends, Small Change: Some items I came across while searching through the National Archives online: FDR with his high school baseball team… FDR with his high school football team… Jim Thorpe in his Carlisle Indian School uniform… Finally, a wonderful old Louisville Slugger advertisement. Pick one team from each region, and one additional team from any region as your wild card choice (five teams in all). You will receive points correlating to each team’s seed for each game that team wins. For example, a Number 1 seed will receive 1 point for each game it wins, a Number 5 seed will receive 5 points for each game it wins, a Number 12 seed will receive 12 points for each game it wins, and so on. Highest score wins. Given the number of entries I expect to receive, this seems to be the best way to avoid a tie. However, please provide your guess for total points scored by both teams combined in the championship game, just in case we do need a tiebreaker. E-mail your list of five teams and guess for total points to uniraffle at earthlink dot net by 12:00 noon EST on Thursday, March 15th to be eligible. Obviously, no late entries will be allowed. One entry per person, please. 1st place: $200, 2nd place: $100, 3rd place: $50 in Distant Replays money. Winners should be announced on or around April 3rd. Good luck. The messed-up accent mark on Pele’s jersey reminds me of when Charlie O’Brien was catching for the Mets. When he joined the team, the equipment manager must not have had any apostrophes to sew on his jersey, because they took a tilde (like in Alejandro PeÃƒÂ±a) and turned it 90 degrees, creating a very bizarre-looking jerry-rigged apostrophe! Sorry this isn’t uni related. This goes off of what I started a few days ago about MLB TV. Wisconsin does have their own version of FSN North, and they broadcast a fair majority of games but A) I am not always around a TV when the game is on, and B) The golf course I work at has dish network, and therefore no FSN Networks. I am, however, always near a computer and would love to watch the Crew on there.. but alas with that stupid blackout stuff, I couldn’t. Aside form the whole putting in a different address things which I see can get you fined and possible legal action to take place…are there any other options? abercrombie and fitch is also the brand of rifle hemingway used to do himself in. Alabama was sporting their throwbacks from last season in last night’s game versus UMass. Count me among those that appreciate the evolution in women’s tenniswear. Johnny O, if you’ve got cable at home, get a Slingbox. You can watch anything you get on cable over the internet or certain mobile devices. You can get one for under $200 on Ebay. One thing I don’t like about the Bulls green jerseys is that the bull is red on the shorts. I made this picture where the bull is green. I like the green bull better. And look at Ben Wallace’s warm-up gear from last night. I have no clue why he decided to tear off only his right sleve. The Butterfly effect, long live the Pittsburgh Penguins. Yeah, a Slingbox would be a good idea. My friend has a Motorola Q phone, and he can watch tv on his phone which also dials in to the Slingbox via satellite, so anything he can watch at home, he can watch on his phone while we’re golfing. It’s pretty cool. was that in Boston? Maybe Belichick came him some “advice”. I think the reason the Tampa Bay (Devil) Rays substituted the green with blue to their uni colors, is to match the Lightning. I wonder if the Bucs will follow the trend, I heard they’re changing their colors and uni’s also. Now (I think) the Rays & Lightning have the same exact color code, Blue, White and Black. Are those new pads for DiPietro? Here’s a shot of the Penguins’ new arena. One of the best logos in sports, right up there with the NY Yankees. Yeah that’s right, I said it..
Looks like the Blues’ goalie pads are supporting the Chargers’ bolt. How does the penguin get the gloves to fit over the tips of his wings? Yeah, a Slingbox would be a good idea. My friend has a Motorola Q phone, and he can watch tv on his phone which also dials in to the Slingbox via satellite, so anything he can watch at home, he can watch on his phone while we’re golfing. Joey, you might also be able to remotely access your home PC and then tunnel the stream into your PC at work. IP proxies — just don’t ask mehow to arrange them! I myself am desparate for the same solution since I love baseball and my country, Japan, is entirely blacked out! And my team’s games aren’t available in any form (broadcast TV, satellite, etc.) here. The conspiracy theorists have it that powerful Japanese media corporations have arranged the blackout so that people will keep watching NPB. Isnt it insanely expensive to download television to your phone? I have a slingbox–it’s great. You can even control the remote, so you can access all the features as if you were right in your living room. Only one person (read: computer) can view the broadcast from a slingbox (which is how it is legal), but for your situation I think it would be perfect. The streaming video is always fast and high quality, depending of course on the speed of the network you are connecting from. I have NFL sunday ticket from DirecTV, and I also travel a lot, so I was worried I would be wasting money if I wasn’t home to actually enjoy the NFL programing–but with the slingbox, I was able to watch any of my games from where ever I was. It’s also great just to catch any regional sports action when your out of town. Plus, in the long run, it’s still cheaper than an MLB.TV subscription. Wow, not only is it Pi Day it’s also Steak and BJ Day! Celebrate good times! no images for #1 and #7..
It’s a little over the top, but it does give a good flavor of the jerseys. It’s a slight change. I’m not sure if I like them as much as Paul does. Not totally in love with the Chargers’ new unis; kind of surprised that Paul likes them so much. I can deal with the navy facemask and I like the white helmet, but making the shoulder bolt horizontal and putting the numerals on the shoulder rather than the sleeve just doesn’t do it for me. And obviously, I don’t like the font, but then again I think everyone but the Bears should use block numerals. Why they created a powder blue alternate out of the new design instead of just keeping the retro powder blues as an alternate is beyond me. That said, at least it’s not a complete travesty like other recent NFL uni changes have been (ahem, Vikings, Cardinals, Falcons, Bengals…) The last team to actually improve its uniform by changing it was probably the Giants (road whites), though I must confess I like Detroit’s changes even though no one else does. FLAMES down the pant leg? that makes all the difference. wasn’t there a NFL Europe team the Rhein Fire or soemthing?? I like the Chargers’ changes overall, particularly the return of the white helmet and the addition of powder blue as at least an accent color. I didn’t see any need to change the lightning bolts on the jerseys and I think I prefer the bolts over the jersey color rather than inside the stripe. The one thing I’ll miss is the navy pants. The white jersey/navy pants combination was among the NFL’s best, right there with Chicago’s home outfit. [quote comment=”60055″]I like the Chargers’ changes overall, particularly the return of the white helmet and the addition of powder blue as at least an accent color. What’s up with this Chargers Countdown? I thought they already unveiled the new uniforms. There still is. I always liked their helmet design, though not necessarily their colors. Here’s a link, if anyone is interested. The new uniforms were a leak/website screwup. This is the official unveiling press conference. Thanks to all on the advice on the Slingbox. I will for sure be looking into that for this upcoming baseball season. 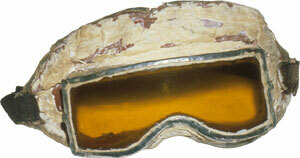 And to Mark in Japan…could this also be a solution to your blackout problems as well?? Johnny, that won’t work for me since my cable back in the US doesn’t carry WGN (and I want to watch the Cubs). I might just go with Gamecast and my favorite forums to stay updated. As for those Wranglers uniforms, I’m not too high on the typewriter-like number font, but the colors are OK. Much better than the goofiness that the Cardinals are using. And get that little logo off the back collar of the jersey! 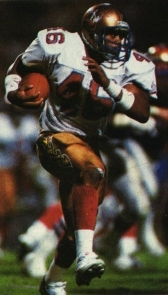 that’s a uniform from the USFL’s Arizona Wranglers from the mid 80s. there were some cool uniforms in that league (chicago, michigan, orlando, tampa). there were some horrible unis, too (denver, oakland, boston/new orleans/portland). What I said was that I had hoped the Cardinals (yes, Arizona) would have gone with something like the Arizona Wranglers (USFL) uniform from 1984, instead of the eyesores they currently wear. Of course they could do without the flame stripes on the pants, and of course they’d have the cardinal head in place of the branding iron on the helmet. The Wranglers’ logo is a branding iron with a flaming “W” on one end. The helmet is metallic copper in color. This was an excellent uniform with a great color scheme, although the red jerseys were never manufactured so the Wranglers wore white the entire 1984 season (all the way to the championship game, no less). The next year they merged with the Oklahoma Outlaws and became the Arizona Outlaws, who also had a terrific uniform. The Wranglers, like every team in the USFL, had standard block numerals; why the USFL uniform site uses that font I don’t know. There was also a WLAF team called the Birmingham Fire, which had flames on the helmet. ahhhh, gotcha, now I’ll be able to sleep tonight. If you look closely at the Chargers’ teaser video, the shoulder bolts in a couple of shots are different even from the still photos — they appear to be pointing the opposite direction from the bolt on the helmet. When the team said they were still tinkering with the unis, apparently they weren’t kidding. Man-Ram wearing a serious do-rag the other day. THAT’S what those side panels are for!! Paul, this may come as a surprise, but the Blackhawks chain-stitching was not used exclusively by them in the hockey world, and there was another NHL team that used it as well. I believe they were the first team to use it, but they certainly are not alone in their choice of thread-weaving. In my research for more ugly jerseys, I discovered that there are two hockey teams that employed chain-stitching on their jerseys. The WHA Calgary Cowboys actually used chain-stitching for the names on the back of the jerseys, as seen here on Don McLeod’s jersey. This jersey is from the 1975-76 season. The NHL Kansas City Scouts used chain-stitching for their logo, much like the Blackhawks do. It can be seen here on Denis Herron’s jersey from the 1974-75 Scouts. Needless to say, I was a little surprised. You need to host that file elsewhere. FortuneCity doesn’t allow linking. Vince, if you want to actually do a full bracket competition, I don’t know how many entries you have already for the pick 5 contest but I set up a pool on Yahoo. Go to this link, and type in 160678 for the league ID and Paul for the password. If this works, the computer will do all of the scoring for us. Let me know what you guys think of this. Oh, and if this works, make your bracket name your name so the grading process will be easier on Vince. Is this just a regular bracket competition? Or are we suppossed to be judging the teams by unis? And, oh crud. I forgot to make my bracket name my name. I made it my fantasy football team name, the Satellites of Love. the logo was better in yellow then the muted ugly gold. Let’s keep the raffle the way Vince set it up. Lots of people have already entered and/or don’t read the comments section. The Penguins logo is not even a top ten logo. Are you trying to say that the Penguin with hockey stick is better than the Red Wings or Tigers D. Or even the Denver Bronco. Let alone the Yankees. Has anyone heard what NBA team will be changing logos. This is from the a friend who is with a company that makes licensed apparel. 2007-08 IDENTITY CHANGES: Please contact your licensing manager for a list of teams that will make changes to their logos and/or uniforms next season. There will be one major change and a few minor color tweaks. No problem Paul, I don’t wanna look like I’m taking charge here. The ‘Cuse are wearing their nike skorts in the NIT !!! Uni Justice For All !!!! That pic was on SI.com in the photo section under top 10 spring storylines. For the record: The quote in question did NOT say that there were only two NCAA teams with black shoes and white laces. It said there were only two Nike schools that fit that description. Now, that may still be inaccurate. But not because of the photo you’ve just linked to. What the heck, I’m in too . . .I’ll send a regular raffle entry too, but this might be fun just for bragging rights “Uni Watch Bracket Champ”!! You know, I like the idea of just creating a Uni Watch bracket pool on some website, just hadn’t thought of it. Sorry. Seeing as this was kind of put together last minute and the deadline is tomorrow at noon and there are already close to 200 entries, I think I missed the boat on this one and will have to score them all myself. I like the new Chargers unis, but seeing them on Phillip Rivers the new placement of the bolts doesn’t look good on a player like Rivers, that is wearing longer sleeves. [quote comment=”60101″]You know, I like the idea of just creating a Uni Watch bracket pool on some website, just hadn’t thought of it. No problem. I’d love to have people keep joining it, though, for bragging rights. Winner gets interviewed? Wow, how much of a mess could that turn out to be? The Predators (blue) and Red Wings (white) are wearing the same jerseys tonight in Detroit as they did when they played last night in Nashville. Elliot, I’m in, too. This should be fun. 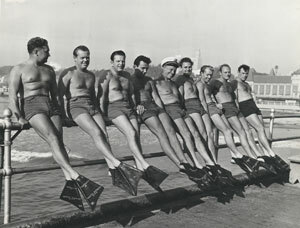 tessa, I would still like to see the rosaries when you get a chance, but you are NOT allowed to have one for the Yanks. That’s just unfair. I couldn’t help but agree. As a San Diegan, and life long fan, I love the new look. As players have said over and over for the past week, it’s a crisp new look for this team, with the huge touches of the past. Originally, I didn’t like the numeral font, but it really has grown on me. They’re sleek and new, but they avoid the trend (see Nike, the Vikings etc.) 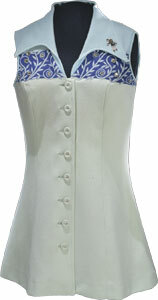 of adding piping, side panels, and everything else. Simple, clean, and beautiful. I just can’t wait to see them in action. Also, I think the sleeves do look pretty silly when worn loose like Rivers has his, but I’m pretty sure QB’s are the only ones wearing it like that. it’ll probably look that way on kickers, too, but they’re going to be goofy looking no matter what they wear. 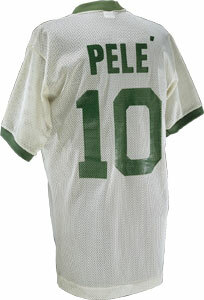 Regarding the Pele jerseys you showed, I strongly suspect that both shirts you show are knockoffs. The NY Cosmos never used the apostrophe any other way except that shown in the action shot. Certainly, the yellow Brasil short is a replica, and an incorrect one at that. 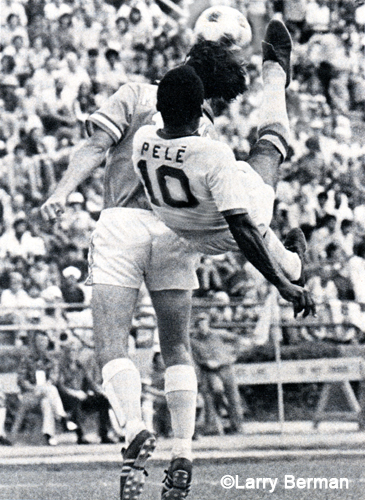 During Pele’s years, neither Brasil nor any other national team that I know of had player names on the shirts. Here is a photo of the 1970 World Cup Final. That was a fairly recent American-influenced innovation that is now required by FIFA at the international level. I believe our World Cup here in 1994 was the introduction of that. If you like video games then buy any Madden game the last few years and you can recreate that uni. They even have that logo in the game. I recall seeing it for several years now. I think i even used it once when i created a team.